In the context of credit cards, the periodic rate times the number of periods in a year. For example, a 1.5% monthly rate has an APR of 18%. In the context of consumer lending, the APR takes into account more than the interest rate applied to the principal per period. Under the Truth in Lending Act, it has a specific definition and includes all the costs paid by a non-exempt consumer borrower that are considered a "finance charge," including fees paid to third parties by the lender if not properly disclosed and excluded from the finance charge (such as credit insurance). The cost of funds or interest rate for an entire year expressed as a single percentage. Significantly, the APR does not account for compounding. For example, if the APR is 36%, the percentage is 3% per month, but the interest rate or cost of funds for the entire year may be greater than 36% due to the effects of compounding. By law, a credit card company or other lender must inform the customer of the APR before any agreement is signed. The APR provides the customer with a convenient number against which to compare the cost of funds for other loans or investments. It is less commonly called the annual rate of return or the nominal annual rate. A loan's annual percentage rate, or APR, is what credit costs you each year, expressed as a percentage of the loan amount. The APR, which is usually higher than the nominal, or named, rate you're quoted for a loan, includes most of a loan's up-front fees as well as the annual interest rate. You should use APR, which is a more accurate picture of the cost of borrowing than the interest rate alone, to compare various loans you're considering. Usually different from the quoted interest rate or face rate on a promissory note,the annual percentage rate is a creation of the federal Truth in Lending Act,which requires that certain loan expenses be treated as if they were additional interest paid over the life of the loan,and then a new interest rate calculated based on that assumption.The intent was to force standardization in calculating the cost of obtaining credit,so that consumers could shop wisely and make informed decisions without fear of hidden charges making credit more expensive than anticipated. In reality, there is no real consensus or practical guidance about the necessity to include or ability to exclude many loan charges from the APR calculations, resulting in continued widespread confusion about the cost of credit. A measure of the cost of credit that must be reported by lenders under Truth in Lending regulations. The APR takes account of the interest rate and upfront charges paid by the borrower, whether expressed as a percent of the loan or in dollars. It is usually higher than the interest rate because of upfront charges. The APR is adjusted for the time value of money, so that dollars paid by the borrower upfront carry a heavier weight than dollars paid in later years. For the algebraic expression see Mortgage Formulas/Annual Percentage Rate. Incomplete Fee Coverage: In principle, the APR should include all charges that would not arise in an all-cash transaction. In fact, only charges paid to lenders and mortgage brokers are included, and not all of those. No charges paid to third parties are included. Examples are title insurance and other title-related charges, appraisal, credit report, and pest inspection fees. Incomplete fee coverage means that the APR understates the true credit cost. If the understatement was consistent, this would not be a major problem, but it is not consistent. Fees that are not included in the APR are sometimes paid by the lender, in exchange for a higher interest rate. The APR in such cases indirectly includes fees that are excluded when paid by the borrower. Mortgage shoppers should not use the APR to compare loans where they pay settlement costs with loans where the lender pays the settlement costs. Assumption That Loans Run to Term: A second major shortcoming of the APR is that it assumes that all loans run to term, when in fact more than 90% are paid off before term. Because the APR calculation spreads upfront fees over the life of the loan, the longer the assumed life, the lower the APR. The point is illustrated in the chart on the next page, which shows what the APR would be if the loan was terminated in any month over a 30-year period. It applies to a 7% loan with fees equal to 5% of the loan amount. Suppose a borrower was deciding between this 7% loan with 5% fees and a 7.75% loan and zero fees. The APR on the 7% loan is 7.52%, whereas the 7.75% loan has an APR of 7.75%. But if the borrower expects to be out of his house in 10 years, the 7% loan would have a 10-year APR of 7.76%, and over five years it would be 8.26%. Mortgage shoppers with short time horizons should not use the APR to compare loans. They should use Interest Cost calculated over their own time horizon, which they can do using calculators 9a, b, and c on my Web site. Ignoring the Paid-Off Loan on a Cash-out Refinance: The APR is also deceptive for borrowers raising cash who are choosing between a cash-out refinance and a second mortgage. The APR on a cash-out refi ignores the interest rate on the existing mortgage that is being paid off. For example, you have a $200,000 first mortgage at 7% and you need to raise $20,000 in cash. Assume a second mortgage for $20,000 has an APR of 8.5%, while a cash-out refi for $220,000 has an APR of 7.5%. The APR comparisons make it appear as if the cash-out refi is less costly, but that is not the case. The APR on the cash-out refi ignores the loss to the borrower from increasing the APR on the $200,000 from 7% to 7.5%. An APR that took account of this loss would be well above the 8.5% on the second mortgage. APR on an ARM: On an ARM, the quoted interest rate holds only for a specified period. In calculating an APR, therefore, some assumption must be made about what happens to the rate at the end of the initial rate period. The rule is that the initial rate is used for as long as it lasts, and the new rate or rates are those that would occur if the interest rate index used by the ARM stays the same for the life of the loan. This is a “no-change” or “stable-rate” scenario. “fully indexed rate,” or FIR. The FIR is the value of the interest rate index at the time the ARM was written, plus a margin that is specified in the note. When the FIR is above the initial rate, as it was during most of the 90s, the rate increases on a no-change scenario. 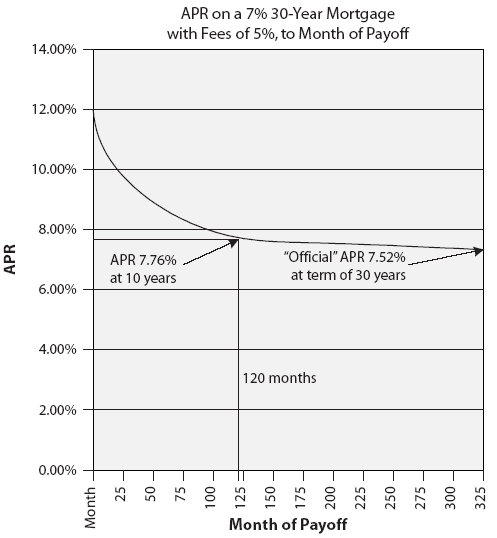 The APR is above the initial rate, even if there are no lender fees. When the FIR is below the initial rate, as it was during the first three years of the new century, the rate decreases on a no-change scenario. If not offset by high upfront fees, this can produce an APR below the initial rate. APR on a HELOC: The APR on a HELOC is the initial interest rate. It thus does not reflect points or other upfront costs, or expected future rates. The most important price feature of a HELOC, the margin, is not a required disclosure. See Home Equity Line of Credit (HELOC)/ Truth in Lending (TIL) on a HELOC. Also see: Interest Cost (IC)/IC Versus APR. The annual percentage rates were significantly different from zero at greater than a 5 percent level of significance, except for the annual percentage rate of change for real softwood pulpwood. Comparing the results presented in Tables 2 and 3 showed that the nominal annual percentage rate of change for hardwood and softwood sawtimber decreased; however, the real annual percentage rate of change for hardwood and softwood sawtimber increased. The results given in Table 2 describe the annual percentage rate of change in stumpage prices in these six cases for the period 1961 to 2002, ceteris paribus. This implied there was a significant difference in the annual percentage rate of change between the periods 1961 to 1981 and 1982 to 2002. Real softwood sawtimber stumpage price in Louisiana rose steadily at an annual percentage rate of change of 2. While in Louisiana, real hardwood pulpwood stumpage prices decreased at an annual percentage rate of -0. For example, a card issuer that advertises its annual percentage rate must also disclose any minimum finance charge, transaction fee, or other charge. The bill would permit consumers to cancel a card account and pay off any outstanding balance under existing terms when certain changes in terms occur (for example, an annual percentage rate increase). 8 billion sector on either the annual percentage rates (APRs) charged or the cost of associated insurance, with most APRs clustered around 30per cent. It is stopping credit card firms describing introductory cut-price rates as ongoing Annual Percentage Rates when they are no such thing. About half have annual percentage rates (APRs) of 18 percent or higher. 50% nondeclining reserve account, the yield supplement account (YSA) designated to compensate for low annual percentage rates (APR), and the availability of excess spread which builds the reserve account to its target and floor of 0.